Magic, Merriness and Santa, Too! “ Ministering peace is the message of Christmas." Please enjoy these two beautiful stories of HeartFelt Holiday Service Projects from San Antonio and Santa Monica. 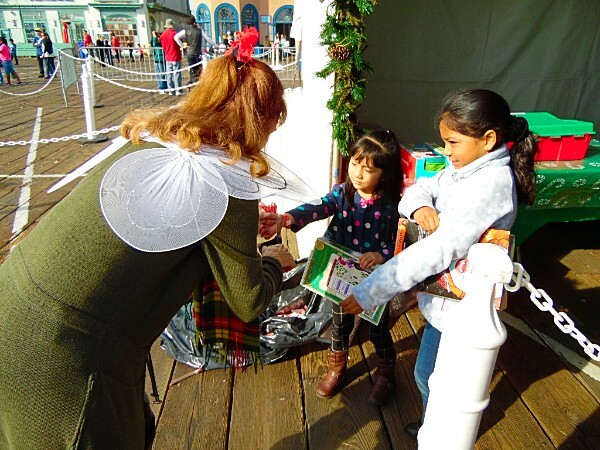 The 2015 HeartFelt Christmas Project on Saturday was underway early in the day on top of the Santa Monica Pier, The first blessing of the day was the sun beaming down and the rain which had been forecasted was nowhere in sight. Steve Shepherd and Patti Rayner were on hand to work with all those who had come to donate their time and their supplies to create a most magical, happy, loving and fun day for families in need from all around the city. Soon the special stands and tents, started popping up, for the popcorn, the hot dogs, Don Francisco's coffee and hot chocolate, the petting zoo, arts and crafts and face-painting, the stage for the singers and dancers, Toyland, just to name some, and the most special place -- for Santa. As the volunteers arrived they checked in to get their designated job for the day. Some were line managers, elves to give out toys, angels to clip the bracelets, face painters, popcorn makers, ticket givers, ticket takers, whatever was needed. Whole families like the Rayners, Hubbards, Peppers, and Youngs have made this project a tradition and their way of inaugurating the season of giving. 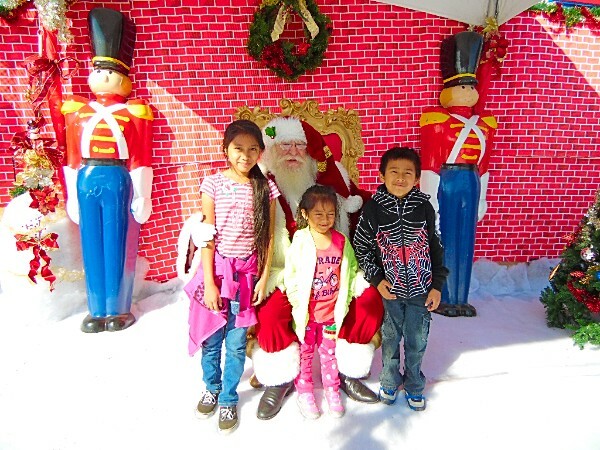 In a seeming blink of Santa's eye, Toyland was lit and overflowing with presents for kids from 0-17, the smells of popcorn, tacos, churros and hot dogs wafted across the pier along with the sounds of festive music. Santa was seated and the many families with their children were lining up already around the corner bursting to come in. Even Jim Harris, the Santa Monica Pier's guardian and manager, was on hand with a huge smile on his face. The pier's antique merry-go-round was ready and waiting for its little and big guests to have their free rides. Finally it was opening time and the families poured in. Where to go first? With their Toyland bracelets secured on their wrists some of the kids bee-lined for their toys, others took their time surveying and sampling all that they could. There was a veritable smorgasbord, all free and abundantly available. The faces of wonder on all, whether older or younger, the whispered thank you's, the grateful "Merry Christmas" exclamations brought tears to many of our eyes giving us way more than we expected. We were honored to once again be on hand as witnesses to this miracle of loving and sharing and caring. Morning turned into afternoon. There was singing, dancing, eating, and over 1500 children had flowed through Toyland and had the chance to let Santa know their hearts' desires. By the time the afternoon waned and only a few families remained, as if on cue the storm clouds started to move in. The event officially closed at 3:00pm and our hearty volunteers were on a mission to clean up and depart before the clouds unleashed a much-needed rain. Like the loaves and fishes the left-over toys, decorations and goodies were distributed to representatives of local charities to continue the blessing of giving for their holiday celebrations. As the first raindrops fell Steve Shepherd and Patti Rayner were still there, overseeing final bits and pieces of clean up, thanking all of us who had come to partake of this heartfelt blessing. Thank you, Steve, Patti, Karen Cicero, Neal Cohen, Kathy Grant, Michael Hubbard, Sonia Trejo, Marla Keesee, Bonnie Shatz, Andreea Vineyard and all who made this event possible! Thank you for the beautiful sharing, Romo and Angel. A Blessed Christmas to All. WANT TO RECEIVE MONTHLY ARTICLES ON INSPIRING SERVICE?